I think if I’d woken up fully, then and there, I might have been able to channel what the heck it was I wanted to get across. 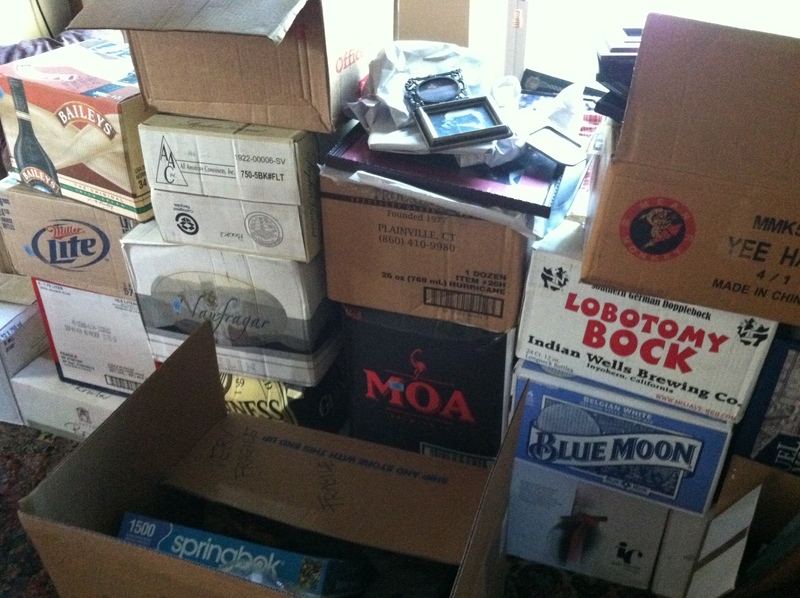 But I’m going to tackle this one anyway, two days later and in the early morning light, surrounded by unpacked boxes. My inner-knowing radar may need calibration. I am having a hard time trusting myself these days. Why? Because a year and a half ago, in the middle of my seemingly normal life, I salted my own fields, retreated, repatriated elsewhere, retreated again, and am still picking up the pieces of my heart, mind, life…. At first, my choices—all the dramatic and insistent maneuvers of the last year and a half—were made with the certain knowledge that I was doing the right thing. That feeling faded to the point that now, no matter which direction I take, it seems fraught with confusion and doubt. In an effort to protect the innocent, I will skip over a lot of the gory details. I will focus, instead, on something that, both literally and metaphorically, defines much of my life over the last year. Some history. As a younger woman, living in Charlottesville, VA, I moved a lot. I could handle it. I had enough stuff to fit into an efficiency apartment, small cottage or two pick-up trucks (usually one, making two trips). Each new place was a new nest I’d feather, efficiently and cozily, knowing I could unfeather it quickly if the need arose. Then I divested, moved back to New York to attend grad school. I lived in a room at the top of a friend’s brownstone. Monastic and luxurious at the same time. I knew what I was doing. When I got married, suddenly the moveable feast that was my life became something more settled. With that came security, steadiness and 25 years in one house. A lovely house more than 100 years old, filled with the joyful objects of family: framed photos, a favorite omelet pan, walls of books, a collection of tablecloths and napkins. That kind of thing. Nothing about the choice to buy a home 40 minutes from work, at the crest of a housing boom, in a rural town (I’m a city girl remember) seemed uncertain. It was right and I knew it. My life was right and I knew it. Sometimes the universe (or my inner voice) tries so hard to get my attention and I just power through life, ignoring the signs. So one day I found myself moving out of the house of 25 years. Moving out of the marriage. Moving. Like the Tin Man, once my rusty joints were oiled, I careened wildly, leaving quite a wake. After my daughter was firmly ensconced back at college, I looked around the home I’d made so lovingly for so long, and was ready (wasn’t I?) to leave it. I started to pack. Box after box. When I left, my estranged husband was to move back in and take possession. Did I let the grief of it all penetrate my plan-addled mind? Did I allow for one minute my inner knowing to communicate with my inner idiot long enough to wake me up so that I could, at the very least, process what was happening? Well, things did not work out. I did not make it a year. By Christmas I was packing again. (There is a lot of story I’m leaving out here; can you tell?) But the point is, I had been so sure. The trauma of changing gears so soon again after the first move was great. Many insistent dreams were showing their true colors as fantasy, idealism, delusion. But, with every box I packed on Christmas Eve, my inner voice was clear. At this point, the sight of a box taped shut with my handwriting on it— “Kitchen/serving platters,” “framed photos,” “books,” “sweaters and lampshade”—creates a visceral reaction in me. Sorrow, panic, comfort, doubt, curiosity and a glimmer of hope all swirl around and make me nauseated. Now, I’m moving again. Unpacking. Again. I have made a decision based on the advice given to me by my heart, my head, my hopes and what remains, essentially, an optimistic outlook. But I cry a lot. I don’t trust myself any more. After so many years of dishonoring the inner voice, I decided to do whatever the inner voice said, without question. Neither approach worked that well. Is there more than one inner voice? Is one my friend and one a saboteur? How to tell them apart? All that being said, I know that I have a deep well of wisdom within me. We all do. I am the only potential saboteur here. I am the only one who can block the voice from reaching me. A friend of mine recently said, “You may not trust yourself, but I trust you. I trust that whatever you do it is for your highest good.” I needed to hear that. This year, my highest good has been served, apparently, by uprooting myself, repeatedly. By humbling myself as I learned at last how insecure I really am; how much my pretense of certainty was a tool of survival but not a path for growth. Okay, inner knowing– I’m ready to listen. This entry was posted in Uncategorized and tagged inner voice, inner wisdom, meditation, moving, packing, trust yourself, unpacking, voice inside your head. Bookmark the permalink. Maybe you just took one too many sips of that *Lobotomy Bock*. Try to remove the judgement and I suspect that you will see that you were right when you made those changes. They likely led you back to a part of yourself that was hidden and needed to be revealed. P.S. My ideas always come when I’m in the bathtub, but I never remember to put a paper and pen in there, so there’s a lot of streaking at my house. Also, surprise puddles that make my socks wet later and remind me that I should be writing. Yes, Karen. That’s I guess what my point was, or that I was moving toward. I revealed something about myself. It humbled me. And isn’t that such a funny name for a beer? I have become friends with liquor store owners in various states as the boxes there are the best for books! PS Wet socks will become your trigger. I can see you standing at a future outdoor graduation, it starts raining and your socks get wet. Suddenly you have an irresistible urge to take pen to paper….